Winners of the 7th Annual Moku O Keawe International Hula Festival were announced Saturday night to an enthusiastic crowd at Waikoloa Bowl in Queens’ Gardens. 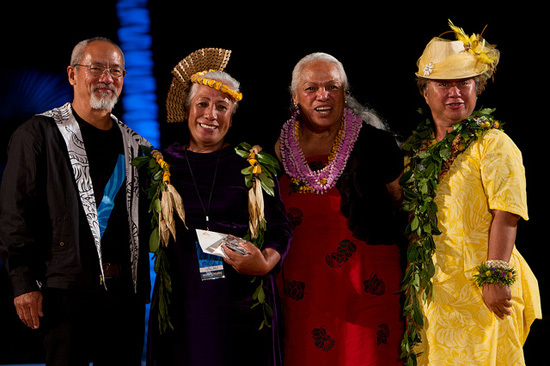 Awards were presented to Makua Solo, Wahine Solo and Wahine Halau, after three nights of competition in ancient Kahiko and modern Auana divisions. (Kupuna Halau and Solo winners were announced Friday). The top-scoring Wahine Halau was Hui Hula Naleikalakupua (1,102 points) from Japan, under the direction of Kumu Hula Yukiko Hanayama. In second place was Hawaii Island’s own Beamer-Solomon Halau O Poohala (1,089 points), Kumu Hula Hulali Solomon Covington. Covington’s niece, Leiomalama Solomon, won the Wahine Solo title; she performed “Kimo Hula,” composed by her great-great-grandmother Helen Desha Beamer, for the auana selection. Fourteen halau — seven from Japan, six from Hawaii and one from Mexico — competed in the three-night event, which also featured Hawaiian cultural workshops and Made-in-Hawaii Marketplace during the day at Waikoloa Beach Marriott Resort and Spa. The Moku O Keawe International Festival is sponsored by the Moku O Keawe Foundation, a private nonprofit organization dedicated to enhancing, enriching and educating the practice and development of hula and its associated arts. Sponsors include Waikoloa Beach Resort, the Hawaii Tourism Authority/County of Hawaii CPEP Program and others.